Congratulations Lela Bouse-McCracken! You won a golden branches disk bead set from Heather Powers at Humblebeads. Email Heather your address and she will send that right out to you. Let's deck the halls with Erin Prais-Hintz at the Tesori Trovati Jewelry Studio. As soon as one holiday is over I can move onto the next season. I only decorate for Halloween in October. I wait until the fourth of July to put up my flag. I never listen to Christmas tunes before Thanksgiving. I love all holidays for their rich traditions and customs, but I love Christmas most of all. All the hoopla in the stores months in advance of the actual season makes my eyes twitch uncontrollably and my ears feel like they are bleeding. In fact, since they started running those crazy lady in the red jogging suit and heels commercials for a certain red retail store, I haven't even set foot in that place. And it is my favorite place to shop (and truthfully, the only place to shop in my town!). It was just too much and I was completely turned off. 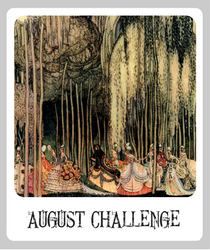 It is very hard for me to think well in advance of a season or a holiday of designs that I might like to put out. I am more of an 'in the moment' sort of artist. Of course, I have to think ahead when there are publication deadlines, but that is really hard for me to do. This year I actually started thinking about Christmas designs in October. I started thinking about what sort of holiday pendants I wanted to create. 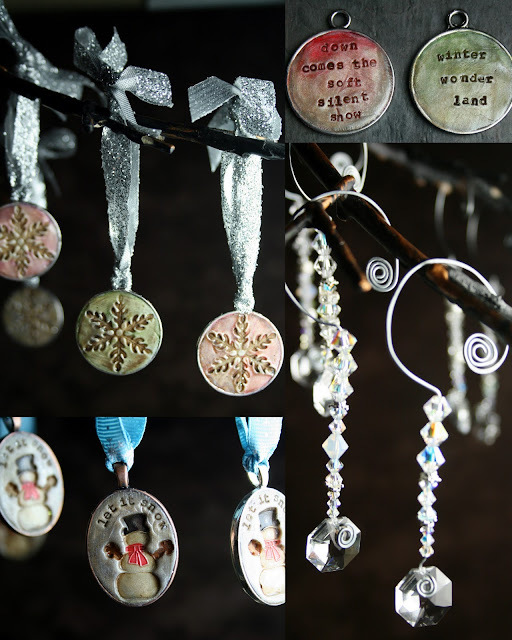 I had this great idea for about a dozen pendants to correspond to a Christmas holiday classic tune. I even found some designs I thought would work. I had some custom stamps made for me. They didn't work. I bought some other ones. Nada. I am not giving up on that thought. It just might be something I can focus on next year. I was sitting at the Gallery Q in downtown Stevens Point, WI where I exhibit my work and I was talking to some of the artists. The place is jam packed with holiday gifts of art in all shapes, sizes and price points. But I noticed an alarming lack of ornaments. In fact, not a single one. I love to decorate for the holidays. We put a forest of trees on our front porch that glow with a thousand white lights. The mantle has my collection of Possible Dreams Santas. This year we even took out the very large (each character is about 10" tall!) Nativity scene that my sweet sister-in-law Mary made for us as a wedding present 19 years ago. And of course there are the handmade-by-me stockings hung by the fireplace (the gas one with no entrance for Santa!) with care (and 3M hooks ;-). Every year that I have been married and probably a few before that, I have made ornaments for everyone in the family. There were years when every friend I had far and wide would receive a new one for their tree. When I started making jewelry I sort of gave up on the ornament tradition because they were getting bling for them instead of their tree. But while sitting at the gallery I had an ephiphany. Why not make ornaments from the 'simple truths' line? They thought it was a wonderful idea so I went home the week of Thanksgiving and got crazy with my clay creations. Even though it was barely Thanksgiving and it killed me to have to do it, I came up with about 25 ornaments and then found the cutest little rustic metal ornament tree to display them on (I actually talked a store owner into letting me buy her display from her!). I have fond memories of the Nutcracker as a child. I still love the music. My dad put on the record of the music every Christmas.I love the ballet and the costumes and the story. I would love to go and see it this weekend with my daughter, Tiny Dancer, if I can steal her away on Sunday afternoon. I made three different Nutcrackers with three different messages and embellished them with glass leaves and berries. Next came the Holiday Botanicals. I had some bezel settings that were larger than I was used to using. And these stamped images fit them perfectly. But I thought they were sort of plain by themselves. So I got some glittery ribbon and a whole box full of picks and I set about creating embellishments that went with each: holly, poinsettia, mistletoe and pine. I got my Martha Stewart on, and I still have the glitter in my hair to prove it! But my holiday decorations are not complete without snow. I like snowmen and snowflakes most of all because they last beyond the Christmas rush and are accessible to anyone. Even though I dread winter, I love the look of it. Quiet and sparkly. For the snowflake, I came up with a design that reminded me of a winter sky at sunset. The colors are soft and seem to melt into the horizon. And the cool part is that they can have a message on the back. I like to put the year and the recipient's name, but it could be a snippet of poetry or just "let it snow." I made some Swarovski crystal "Blingcicles" too. 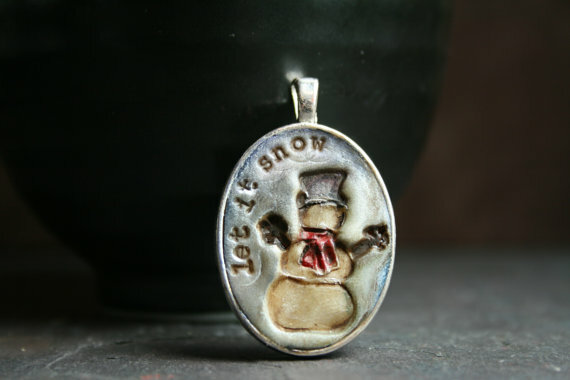 And of course, my little made to order snowman, while a perfect pendant, would make a great ornament as well! 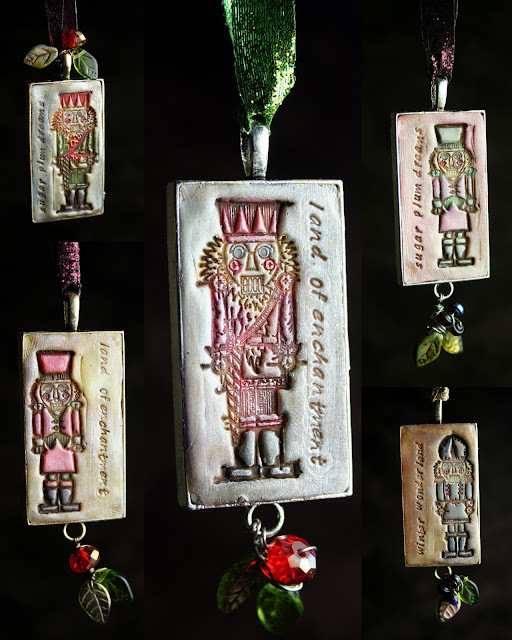 Each of these works as an ornament but can be worn as a pendant as well, like a double gift! I plan to make them for family members this year to get back to the tradition. Would you like to win a 'simple truths' ornament of your very own? 2. Do you think ahead for holiday designs, or are you more of an in-the-moment artist like me? 3. What designs for the holidays are you creating? I love all the tress you put on your porch...its so beautiful! All of your ornaments are beautiful but I relly love the snowman the best. I try to think ahead for holiday crafts but usually plan to many things to make and then have to cut back due to time constaints. Right now I am making some simple necklaces for the women on my list. Your house looks beautiful! I love all your ornaments! A brilliant idea to turn them in to these! My favs are the snowflakes and holiday botanical and I would love any of these!!! I am not a think ahead person- well maybe that isn't true- I do think ahead, I just do not do ahead! I think I need the pressure! I am doing snowmen and snowflakes this year in many of my gifts and cards- I just seem stuck on that theme right now - most likely because it isn't close enough to Christmas! I LOVE your ornaments ! After Christmas my house looks so naked without decorations . To avoid an undressed house,I have a collection of Snowmen that come out until Valentines day! I would love to add your Snowman pendant to my collection ! Hi Erin! All of your ornaments are lovely, but my favorite are the Nutcrackers. They remind me of my childhood, when my mom would take my sister and me to see the play each year. Those are wonderful memories! Love your ornaments, Erin! My favorite is the snowflake. Let it snow. Very appropriate for Alaska. I'm a very of the moment jewelry designer. I have come to the point in accepting this in myself. I just put the jewelry out the next year and consider myself a great plan aheader! You knew I was gonna stop by for a nutcracker! As for Holiday designs? No...never plan...last year I was wire wrapping an hour before we opened gifts! You already know how much I adore your Simple Truth pendants! I collect snowmen so that cute litte snowman pendant would be the one for me. I don't really create jewelry for specific holidays because if it doesn't sell I have to hang on to it for another year. I do create piece in holiday colors, but that's about as close as it gets. Love your Christmas decorations, especially the front porch! Your ornaments are spectacular! You are so creative and inspiring Erin! My favorite is the snowflake. Snowflakes are my favorite element of winter, some years the only ornaments on our tree are snowflakes. I am definitely an "in the moment" artist. I know that I should probably start working on a holiday collection in July, but it is so hard to wrap my mind around Christmas when I am being inspired by sea creatures and warm sunny days! 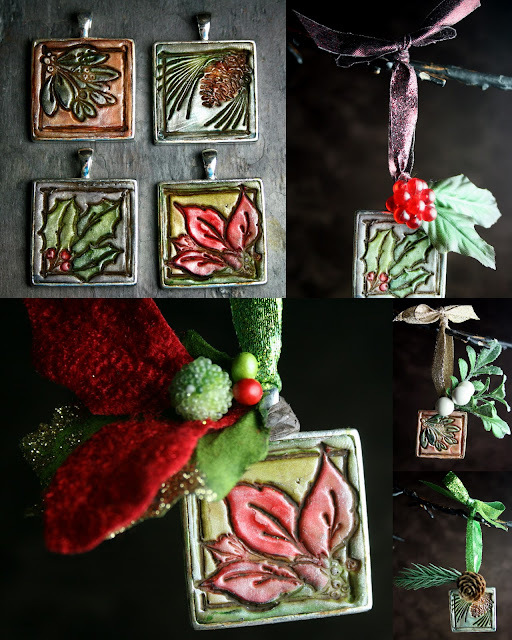 My designs for the holiday season are focusing on pine cones, garnet and snowflakes. Being inspired by the two ornament blog hops I signed up for, I am hoping to create ornaments to give as gifts this year. Notice I said hoping! And this gardener loves your botanicals (especially the pine branch--I seem to have a thing for pine). Hi Erin, I always love reading your posts and this one is a gem. I like the Snow ornament. I made some fir tree charms this year. I really love to make charms and it was fun to make them. I can see that you really enjoy what you make!! Your enthusiasm is a pleaure to read. Hi Erin, Your ornaments ideas are great and I really like them all, but my favorite are the Nutcrakers I have always been intrigued by them. I am more of a in the season doer although I did start thinking of ideas about mid November this year and I have been making a lot of Snowmen, Angel, and Snowflake designs. Oh and I agree with you about the commercials of the woman in the red jogging suit.UGH! I had tried to plan ahead for seasonal designs, but never really got into the spirit until the season was upon me! My little sleepy Rudolph beads were just finished about a week ago... I so wish I'd thought of making them sooner! Now my head is filled with Christmas ideas, I only hope I'll remember them early enough for next year! Wow Erin - those ornaments are brilliant and love the process you explained on what went into them! I have to say I love the Nutcrackers - reminds me of living in Munich Germany when I was a kid. I so miss going to the Kristkindlmarkt and St. Nicolaus. Mom and I usually don't make things to go with the holiday, though that might be one of our goals for next year. I do want to make up some "Sugar" beads but that is about it. "Smack forehead", haha is right Erin! I have a lot of those moments and usually it's too late. These are just the cutest things, I LOVE them. Well, hard to choose, but I think it would have to be the nutcracker . . . yes! And sometimes I plan ahead and sometimes I don't. I actually like you had a great idea for a certain twelve days as well, in photography this year but I too couldn't figure out how to make it work. Now I have another 365 days to figure it out. Sadly I haven't been creating much lately, and missing my metals class. Hopefully soon, so many ideas waiting to get out. I would love the nutcracker! I have not seen the ballet in person, buy I love it. The pinkish snowflake.....that is my favorite. I love that ribbon idea. I'm making some raspy vintage snowmen so I'm off to scavenge the ribbon aisle. 1. They are all absolutely lovely Erin! Can't pick one. Maybe either a nutcracker, or a snowman. 3. I do love to make christmas decorations. So far this year I've made seven tree ornaments. All from beads, but different techniques. I like to sit with my children and make them also. But we have not yet done that this year. But they just made a tree ornament each out of lego, inspired by a link Lori Anderson posted on Facebook. :-) I try to incorporate or try at least one new technique each year. This year I bought a few star-sceletons to put beads on. Looking forward to do that with my family. Oh,all of your ornaments are awesome!The nutcracker is my favorite,each Christmas,I get my grandson one.He's got quite a collection,being almost 16.I think he'd love it,as I do.Most of the time I'm an in the moment artist,having 2-3 projects at a time.And the answer to the third question is Angels.I have a tree full of angels and I love it. Erin,you make the nicest ornaments! So hard to choose...but my favourite is the Nutcracker - not your usual Christmas design. I would wear mine all year. The nutcracker ornaments are super cute, but I would choose one of the snowflakes for myself. Even though I truly hate winter, there is something classical, timeless and beautifully geometric about snowflakes that always turns me on. Beautiful ornaments! All of them -- there's something for everyone, whether the person prefer softer colours, cute snowmen, the nostalgia of the Nutcracker or vibrant holiday colours. I think my personal faves are the snowflakes and holiday botanicals. If I had to pick one it'd be a snowflake. These are all so pretty! My favorite has to be the pink/red snowflake though - I live in a climate with no snow, so a "white Christmas" has always eluded me. I always put up knit/crochet/paper snowflakes when it gets to be the holiday season! I am like you - I have a hard time making things when they are not in season. I just can't turn on that holiday button in September! For Christmas this year I am keeping it simple with the jewelry-making: necklaces for my mom, sister, and a couple friends. I really love your botanicals, especially the pine. The holly one looks like a graphic I did on a company christmas card years ago. Since my daughter's birthday is not until Dec. 10, we try not to decorate until after that. This year in a new town, I am having to think hard on how to rearrange the furniture to get the tree up! I do think ahead in design for the holidays because I find more people are shopping early...unlike me. I am like you a more fly by the seat of my pants person but I would like to be a better planner. I too cannot stand the fact the stores have their Christmas decorations out in sept....tooo early! I think your ornaments are wonderful...love the snowman. Erin I love all the ornaments, but if I had to pick (when I WIN) I kinda fancy the Holiday Botanical. Hey is anyone participating in the ornament blog hop? What day is that on? I try to think ahead, but like most others, its the day before a craft fair, and I am still adding. The best thing about "stocking up" is what doesn't sell becomes an instant "add-on gift". My grandkids teachers are all getting Handmade Christmas ornaments this year. Now that I am in FL I do miss the Christmas snow (but only for Christmas) and love your snowman. Oh my, your ornaments are gorgeous! I particularly love the nutcracker, as I collect those.. Of course, I also love the snowman, because I collect those, too! I always THINK ahead for holiday designs...it the actual creating that somehow takes a backseat to the constant "goings on" in my life! This year, I focused on bracelets and earrings in Holiday colors, with touches of trees, snowmen and the like incorporated into the final product. This season will always remain my favorite! I love your simple-truths-esque ornaments and would be so proud to win your Holly Botanical Ornament. I am more of an in-the-moment kind of gal and it makes my teeth itch that Christmas starts in the stores before the Halloween costumes are put out. In our house, we don't decorate until Christmas Eve and the decorations stay up until the 6th of January (Epiphany -- the real 12 days of Christmas). I'm a clergy spouse and so the focus of "the season" that everyone call "Christmas" is actually Advent with it's own carols and traditions. I think it is sad that we "throw out the baby with the wrapping paper" when the true season is just beginning. There! Now I'll get off my soap box and say how very much I love your work. The trees are beautiful and the stocking is cheerful. One of my earliest Christmas memories is my Mom taking me on a train to see the Nutcracker. Nonetheless, I think I like the pinecone and botanicals best. They represent the quiet peace filled moments I so love in this season. I am working on snowflakes and valentine's pieces right now. Oh, your porch is so beautiful!!! And I love all of your ornaments, what a clever idea to make them like your pendants :) Gotta love something that can do multiple tasks! The nutcracker is my favorite, I have always had a crush on the nutcracker from the ballet... as good as prince charming, right? I am more of an in the moment kind of designer... I'm better at designing when I can feel what I need to design... if that makes sense. Though some images I am able to grasp year round lol. The nutcrackers are my favorite. When I was little, my great aunt made customized stocking for all the kids in my generation. All the other girls got cutesy things like bunnies with santa hats....I got a stern looking nutcracker. Not sure why, but I liked having the unique one, and the nutcracker has become my holiday "thing". I try to think ahead for the holidays, but I mostly just settle on a color scheme in the months ahead and then it comes together right after Thanksgiving. This year, however, I haven't made anything new for the shop or myself. We had a disaster earlier this year that wiped out our entire inventory, so we're focusing on building up everyday items in the shop again. Next year we'll go all out, though. And I am very much everything to its season. Heck I just started making my gifts. Luckily it's mainly earrings though I do have to run out and get some leather for a man's necklace. Your front porch is inviting! Beautiful! If I could choose an ornament to win, it would be the 'Let it Snow' snowman. Can you see me wearing it in Florida? A girl can dream, can't she? All your ornaments are lovely. I am not a think ahead person either, I have to have deadlines to work with, some times these deadlines come way too early. For example, I still have not figured out the magazine deadlines, something on my 2012 to do list. Holiday designs, are the ever-popular christmas trees, and some party necklaces. I love the trees on your porch, that is beautiful. I don't think ahead too much as far as the holidays. Like you I twitch when I see Halloween candy out in August and Christmas decorations out in October. It makes me crazy. I love all the ornaments, the nutcrackers are amazing. If I had to pick though it would be the snowman because I collect them too. WOW! You created amazing ornaments! I grew up in a house which celebrated both Hanukkah and Christmas so I seem to have inherited a broad color palette for holiday decor. Nine years ago I moved to the middle of pine forest country in the South and now I generally use natural elements to decorate. Pine cones of all sizes, magnolia leaves, holly branches, and all sorts of pods and seeds find their way onto my mantel. I also prefer a natural element in the jewelry I make for the holidays - much like your Holiday Botanical designs. Last year, for the first time, I spent Christmas with my in-laws in Mexico. My mother-in-law and I took a walk one morning and collected grasses, branches, and leaves. When we got home she ran around pulling bits of yarn and ribbon out of drawers and cabinets all over the house. We spent a wonderful afternoon making garlands and wreaths which we hung to decorate every room. Count me in for the Botanicals. I am much more of an in-the-moment artist too. I always feel a little like I am wishing my life away if I try working too far in advance. Although I did start making my star-book ornaments in October this year, that was more due to the fact that I just wanted to play with the structure! Your porch is so festive and pretty! I am an in the moment kind of girl too. I find it hard to plan ahead for the holidays. I had a holiday event to go to last week already and I had to design a crystal necklace and earrings to wear with my outfit and I created it the day of the event. Nothing like pressure! Oh and Erin - the Nutcracker is a big deal at our house. We have quite a few of them - love them! I love the botanical ornaments/charms. Really, all of them are great. I do plan ahead for the holidays as the time seems to fly. Love your holiday decorating. Erin, I do believe you are my other daughter......I feel the same way about the pre Christmas hoopla. And that lady in red! Your house is beautiful with all the trees. And all of your ornaments are beautiful and fun. Great idea for an ornament. Have a great Holiday. Hope to see you soon. I would LOVE the nutcracker! I tend to be more last minute and then shake my head as well... missed opportunities abound! I'm definitely spur of the moment for gift making though the ideas for specific gifts swirl around in my mind starting in early November. I al ways start with my own party jewelry, just made a sparkly tassel necklace to go with an animal print, will make at least three necklaces this year for gifts (and a lot of food gifts, my other passion). I love all the ornaments you have, but we are a snow people collecting family! Your home looks beautiful and so inviting. I would love to sit down on your porch with a hot chocolate and chat. Your work is unique and wonderful. I love the nutcrackers most of all, but I agree that the snowman theme runs all winter long. You could send me any one of your designs and I would be very happy. Enjoy all this wonderful holiday brings your way. I am swooning over your front porch!!! I love all of your ornaments, so beautiful. The pine cone is my favorite. Love it all. I have to agree with you on the decorating thing. Companies are jumping the gun all the time. No question - my favorite is the nutcracker! I love your front porch decor - so beautiful & natural! If I were lucky enough to win, I think I like the pine cone ornament the most. I had been making Christmas items for the past couple weeks, in preparation for an Open House I hosted this past weekend, but now I'm a little burned out on holiday designs. I might make a few more, since I just received a snowflake pendant from a certain talented artist (>wink<). While I agree that the TV commercials started WAY TOO EARLY this year, that lady in the red suit cracks me up!! Your ornaments are wonderful. My favorite would be the Nutcracker because it is still a tradition for my daughter and I to go and see it. Each time is great. I love your front porch also - love those little white lights! !.